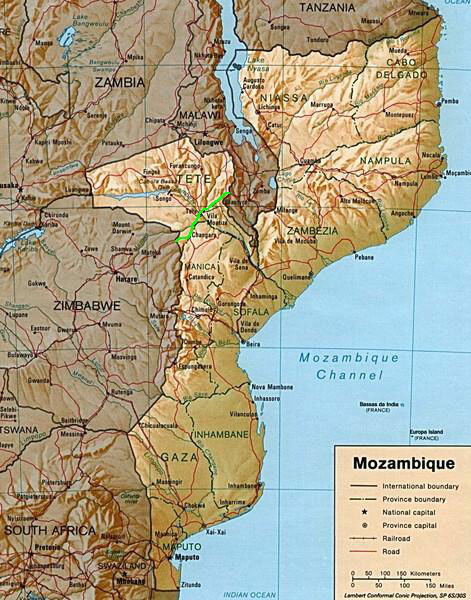 276 km of cycling - as part of a bicycle world trip - from the border to Malawi via Tete Corridor southwards to the border with Zimbabwe. 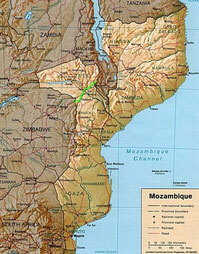 Do you like Cycling Mozambique? With our fairly expensive transit visa, usually just valid for 72 hours, the both of us got 7 days in the Mozambique consulate in Malawi. Therefore we were basically not in a hurry, but there wasn't particularly much to see on the less than 280 km long Tete Corridor to Zimbabwe. The first day we cycled to the only town in this corridor, not surprisingly called Tete. The evening before we accidentally figured out, that this would be my 800th day of travel on this trip and I found that a decent present would be appropriate. And this was the reason, why Garfield, now travelling around the world with Hugo for actually already more than 27 years, for the very first time got a ride with someone else: with me! I deeply appreciated and enjoyed this honour and, as far as I could say, so did Garfield, cause for the very first time he was sitting in the front. We cycled together my 40,000th km of this trip and took a day off in Tete, one of Mozambique's hottest places. In the evening I recognised one of the worst possible losses: my plastic bag with camera, cash, credit and bank cards and passport. For the waitress who found the bag and who looked in it for a phone number to call me, it would have been more than worth to simply keep it all, particularly when considering her salary. But she didn't keep even one single note and I was lucky to get back virtually everything. I went back to her once again to give her something in return and she was so happy about that. But it was up to me to thank her with a "muito obrigado" as often as I could.